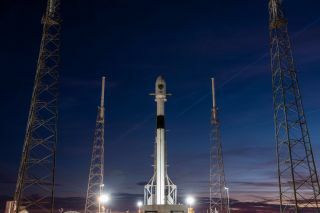 WASHINGTON — SpaceX on Tuesday scrubbed the Falcon 9 launch of the Air Force’s first GPS 3 satellite. Another attempt is planned for Wednesday at Cape Canaveral Air Force Station, Florida. The commander of the 45th Space Wing that oversees launch operations at Cape Canaveral said calling off the GPS 3 mission was the right thing to do. "We saw some sensors today that gave us a little bit of an alarm so we decided to hold the launch at that time," Air Force Brig. Gen. Douglas Schiess told SpaceNews during a conference call Tuesday. Also on the call were Air Force Secretary Heather Wilson and Lt. Gen. John Thompson, the commander of the Air Force Space and Missile Systems Center. Wilson was at Cape Canaveral to watch the launch with Vice President Mike Pence. The 45th Space Wing is responsible to ensure public safety during every launch from Cape Canaveral or Kennedy Space Center. "The team is always making sure we have mission assurance and safety as our main priorities," Schiess said. "We did that today." The weather is not a concern at this point, he said. "We're working through some issues" that could delay the launch beyond tomorrow, Schiess said. "We're are now working with General Thompson's folks and SpaceX to see whether we can launch tomorrow," he said. "When we get ready, and the rocket's good, we're looking forward to a great launch of the first EELV launch for SpaceX." The Evolved Expendable Launch Vehicle is the Air Force program that procures launch services. Wilson agreed with the wing commander's decision to hold off. "We were hoping to see the launch of the GPS satellite this morning," she said. "It's certainly on my bucket list. I hope to be able to come back and see a launch. But I also give a lot of credit to the folks who are running the operation, that safety and mission assurance come first, and they made the right decision this morning." This is SpaceX's first mission awarded by the Air Force under the EELV program. The contract was awarded to SpaceX in April 2016. SpaceX has an additional four GPS 3 launches on contract, all of which will be launched on Falcon 9. Thompson said that regardless of when the launch takes place, the Air Force is encouraged that SpaceX is now competing for military launches. "For the first time in the history of the EELV program, we have competition back," he said. "This opportunity for SpaceX to compete and win this mission — and then put up such as a significant payload as our very first GPS 3 satellite — is tremendously significant not just for SpaceX and for the satellite provider Lockheed Martin but for the United States," Thompson added. "Our launch industrial base, particularly for big rockets, is very robust right now."